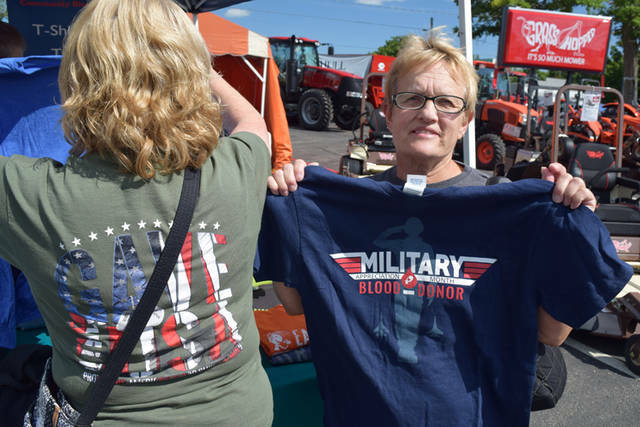 Bill Fraley (right) wore the Stars and Stripes T-shirt from this summer to the 10th annual Community Blood Center T-Shirt Day at the Darke County Fair. He stopped by the CBC tent with his son Caleb. Dot Ellis and Jackie Magee stopped by the Community Blood Center’s tent at the Darke County Fair. 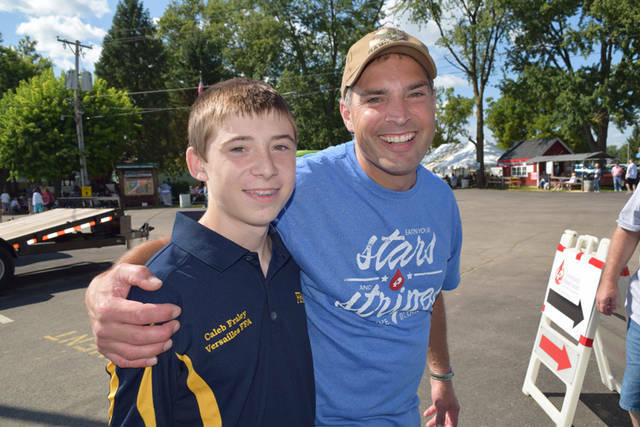 Ivan Patterson wore his vintage 1st Apheresis LifeLeader Event T-shirt to the 10th annual Community Blood Center T-Shirt Day at the Darke County Fair. GREENVILLE – Summer lingers for the annual Great Darke County Fair. Farm chores, even back to school, are put on hold for nine glorious days in “Great Fair-yland.” The 10th annual Community Blood Center T-Shirt Day came midway through the fair on Wednesday, a day with temperatures so unseasonably mild it suggested even the Fair will soon give way to fall. Donors made sure to wear their favorite CBC T-shirt on T-Shirt Day so they could stop by the CBC tent and register for door prizes. The grand prize of a Family Fun Pack of four tickets to Kings Island went to Kris Shelley from Greenville. CBC Darke County Account Representative Dana Puterbaugh set the goal of 300 donors visiting the tent wearing CBC T-shirts and came close with a head count of 250 donors. Greenville was again the best-represented town with 100 donors followed by Arcanum with 24 and Versailles with 22. It wouldn’t be T-Shirt Day without a visit by Ivan Patterson wearing his vintage 1st Apheresis LifeLeader Event June 28, 1992 T-shirt. “It’s my favorite T-shirt,” Patterson said, and he has plenty. The retired founder of Korrect Plumbing is a CBC pioneer platelet and plasma donor. He made his milestone 500th lifetime donation in January and turned 91 in February. Patterson now has 511 lifetime donations and still is collecting T-shirts. 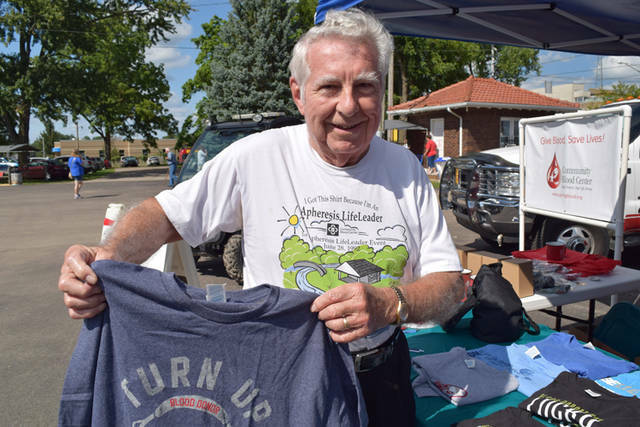 New Madison donor Jack Wyne wore the Iron Donor T-shirt, but he couldn’t name his favorite. “That’s a good question; I just grab one,” he said. Jim and Carol Holsapple from Arcanum wore their favorites: American Spirit for Carol Holsapple and Buckeye Blood Donor for Jim Holsapple. “My favorite donor T-shirt is the last one I got,” Melissa Oswalt from Union City said. What makes the fair so great? “Community,” she said. Donors can connect with Community Blood Center for the latest information and services at www.GivingBlood.org. Individuals can get fast and complete answers on how to make their first donation, organize a blood drive or bring Community Blood Center’s education program to a school. Community members can get all the updates in the CBC/CTS newsroom, find quick links to Community Blood Center’s social media pages or schedule an appointment to donate by connecting to www.DonorTime.com. Donors are required to provide a photo ID that includes their full name. Past CBC donors also are asked to bring their CBC donor ID card. Donors must be at least 17 years of age (16 years old with parental consent: form available at www.givingblood.org or at CBC branch and blood drive locations), weigh a minimum of 110 pounds (donors may have to weigh more, depending on their height) and be in good physical health. The Food and Drug Administration changes blood donor eligibility guidelines periodically. Individuals with eligibility questions are invited to email canidonate@cbccts.org or call 1(800)388-GIVE. Donors can make an appointment at www.DonorTime.com.